Hooper Strait Lighthouse – Chesapeake Chapter U.S.L.H.S. The entrance to Tangier Sound was marked with a lightship from 1827 or 1828 to 1845. The first lighthouse was constructed in 1867 and destroyed by ice during the winter of 1877. The second screwpile lighthouse was constructed in 1880. The structure was designed and built in Baltimore, then dismantled and re-erected at the site in October of that year. It had a fifth-order fresnel lens. Keepers were not allowed to have family living at this lighthouse. Water for drinking, bathing and cooking was collected from the roof’s rain gutters, groceries were rationed and arrived once a week from the mainland, and the bathroom facilities were located outside on the deck. 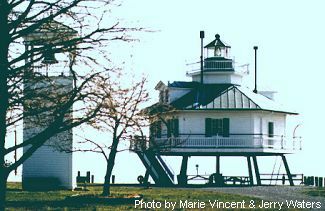 The lighthouse was slated for destruction in 1966 when it was acquired by the Chesapeake Bay Maritime Museum in St. Michaels, MD. The move required the lighthouse being was cut from its original pilings and cut in half befor being transported up the Bay to its new site in November of that year. It is open to the public.